Toilet tissue comes in individually wrapped rolls with 4" x 4" perforated sheets wrapped around a core. 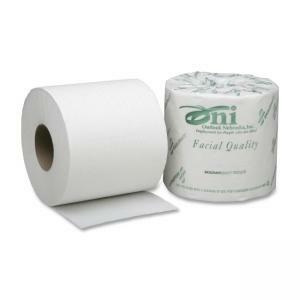 Each roll contains 550 sheets. Conveniently sized packaging provides easier handling and a smaller footprint. Two-ply tissue contains 100 percent recycled material with a minimum of 35 percent post-consumer secondary fiber.